The expo hall was filled with ongoing talks on stages, each focusing on its own field of Shopping, Marketing and E-Commerce. This year the most visible aspect of the companies present at the fair was the influx of mobile payment methods and the current and soon to be launched mobile wallets, all having their own stands. Nobody seemed to be thinking of these as anything but the norm, but the setting might slightly have something to do with this forwards thinking. Virtual shopping as the new normal? Payment Highway organized a private networking and learning get together after the expo which was held at our office’s Showroom lounge in Vallila. The event was headlined by our very own Sitting Bull of Payments, Sami Karhunen, whose talk on the virtualization of physical stores and the effects of everyday automatization definitely brought new things to every listener's mind, going over topics ranging from the limitations of physical stores to the ongoing trials of drone shipping and smart pizza delivering robots, which are able to speed away from hooligans wishing them harm. After Sami’s talk had set the mood and opened our thinking towards radical new ideas, the audience was eager to hear from the man of the hour, Neste’s Head of Payments and Payment Methods, Kai Lindström. 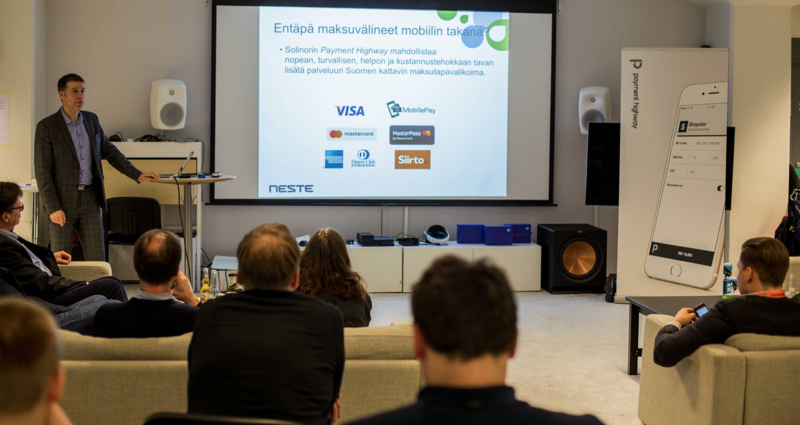 Kai’s talk would focus around Neste’s payment app, through which their customers will be able to pay for gas with all of the different mobile payment methods available in Finland and the neighboring countries. He clarified the thinking behind Neste’s decision making that led to their vision of this being the future, as well as the obstacles which needed to be tackled before these new tools can be implemented. Naturally, Neste chose to work with Payment Highway for all their payment needs. As interesting as the talks were, they were merely the wind up for the free flowing discussions that were to follow. Participants engaged in great discussions in the showroom regarding the future of payments and the ever more quickly digitizing world around. If you need payment services to help realize your ideas, don't hesitate to contact us! Subscribe to our newsletter to get our newest blog posts delivered to your inbox.